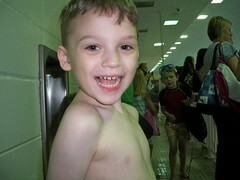 Max started swimming lessons at Mercer Aquatic Center. The same place we had Max's fifth birthday party. Daddy said that he did very well and wasn't scared. Max said it was a lot of fun, but the kids in his class are very short. I told him this will probably be the norm in his life, and he should be happy his neck is above the water. Way to go Max! Enjoy you lessons!